Zoom uses Just-In-Time (JIT) provisioning with Single Sign-On by default. This means that when a user tries to login, a Zoom account will be created for them based on your SAML mapping. 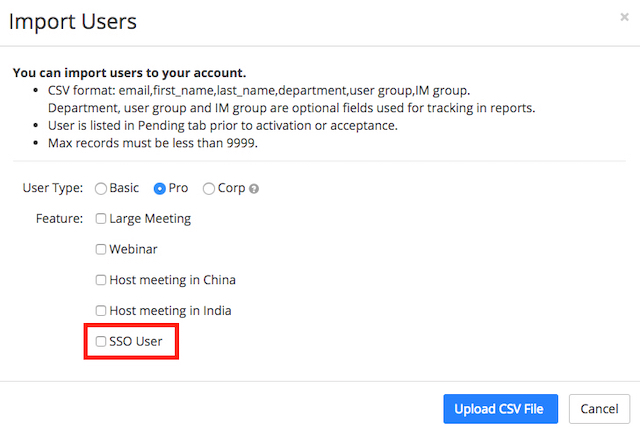 However, if you do not want Zoom accounts to be automatically created when a user attempts to sign in, you can use pre-provisioning instead and create users via REST API or CSV. Login to your Zoom account and navigate to the Single Sign-On page. Next to Provision User, choose Prior to Sign-In. When pre-provisioning is enabled for your account, the ssoCreate API call will also be enabled for your account. Users created with this API call will only be able to login via SSO. No password will be created. If the user is a Pro user, the API call will generate a Personal Vanity URL using the user name (no domain) of the provisioning email. If user name or PMI is invalid or occupied, it will generate a random number/random personal vanity URL. Learn how to add users via REST API. Save the spreadsheet as a CSV (comma delimited) file. Designate Basic, Pro, or Corp as the license type. Select any features you would like to apply. This pertains to all users included in the CSV file. Click on your .csv file, then choose Open. The users will be automatically approved and appear in your users list.